This special Copper Eiger will be available for a VERY limited run. The material is extremely expensive, so we are not sure when or if we will make them again. Get yours while supplies last! 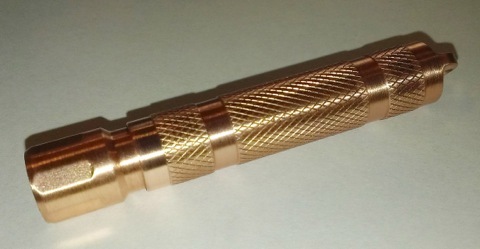 The Copper Eiger uses Quantum Tunneling Composite (QTC) Technology for variable light output. This allows you to adjust the light output from a dim glow to the brightest single AAA battery flashlight available. Eiger flashlight is engineered to use all different battery chemistries: Alkaline, Lithium primary, 3.7 Volt Lithium Ion Rechargeable 10440 or NiMH rechargeable batteries.